Maurizio Sarri reasserted his authority on the sideline, and so did Chelsea on the field. After Kepa Arrizabalaga refused to be substituted in the League Cup final, Sarri was determined to send a message to the world's most expensive goalkeeper by dropping him from the lineup for Wednesday's match against Tottenham. "Kepa made a big mistake," Sarri said. "He had to pay for it." He wasn't missed at all. In fact, replacement Willy Caballero had little to do as Chelsea cruised to a 2-0 victory over a Tottenham side that failed to get a shot on target for the first time in a Premier League match since 2013. While Chelsea remains sixth, the win over its third-place London rival roused a team and a manager seemingly in turmoil a week ago after being knocked out of the FA Cup by Manchester United. 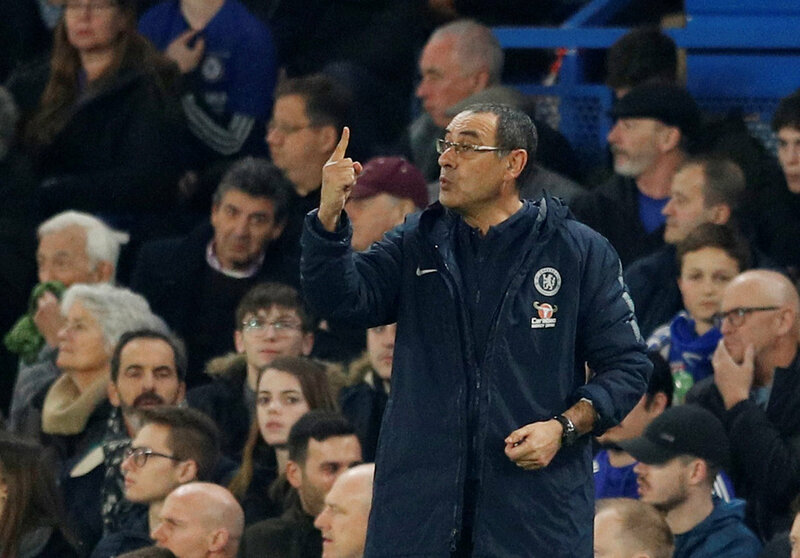 "It's normal if you lose two matches in a row you are under pressure... maybe more at Chelsea," Sarri said. Instead, it was a calamitous night for Tottenham. Pedro Rodriguez cut through the defense and poked the ball through goalkeeper Hugo Lloris' legs in the 57th minute. Caballero created the second in the 84th with a long ball flicked on by Olivier Giroud. Instead of making a simple clearance, Kieran Trippier inexplicably sent a back pass beyond 'keeper Lloris and into the net, displaying the instinct of a striker rather than a defender. With their second straight loss, Spurs hopes of securing one of the four Champions League qualification spots for a fourth successive year are in the balance. "Tottenham Hotspur, it's happening again!" Chelsea fans chanted. It was a cutting reminder of Tottenham's failure to win the league since 1961 and losing ground whenever it looks to be challenging for a title. Spurs didn't manage a shot on target for the first time in a league match since December 2013. Mauricio Pochettino's side has fallen eight points behind Manchester City and nine back of leader Liverpool, even with top scorer Harry Kane back from injury for the past two games. "I'm not afraid. I am free in my mind," Pochettino said. "It's not a drama." Fourth-place Arsenal has closed the gap on Tottenham to four points and Manchester United is only a further point behind. Meanwhile, Arsenal beat Bournemouth 5-1 with its fans chanting: "Tottenham Hotspur, we're coming for you." Coming up next is Saturday's north London derby at Wembley Stadium. The next day Chelsea has a short trip across west London to relegation-threatened Fulham - just the type of match Sarri needs to dampen uncertainty over his future. "I spoke with the club two or three times in the last few days," Sarri told reporters. "The problem wasn't so big as you wrote. Maybe it wasn't the truth, I don't know, but it's not a big problem for me." Chelsea has now gone three games without giving up a goal. After beating Malmo 3-0 in the Europa League last Thursday, Chelsea held Manchester City scoreless in the League Cup final through 120 minutes, only to lose on penalties. Sarri wanted to substitute a seemingly injured Kepa before that shootout only for his goalkeeper to refuse to obey orders. While Chelsea tried to dismiss it as a misunderstanding, Kepa was fined a week's wages on Monday and was forced to apologize. Kepa, who joined in August for 80 million euros ($93 million), was reduced to a spectator against Tottenham as player power at Chelsea was subdued. "It's a message to my group," Sarri said. "That we are a group, we are 25 players." But Kepa remains his first-choice goalkeeper. "We cannot kill him," Sarri said. "When you are young, you can make mistakes."